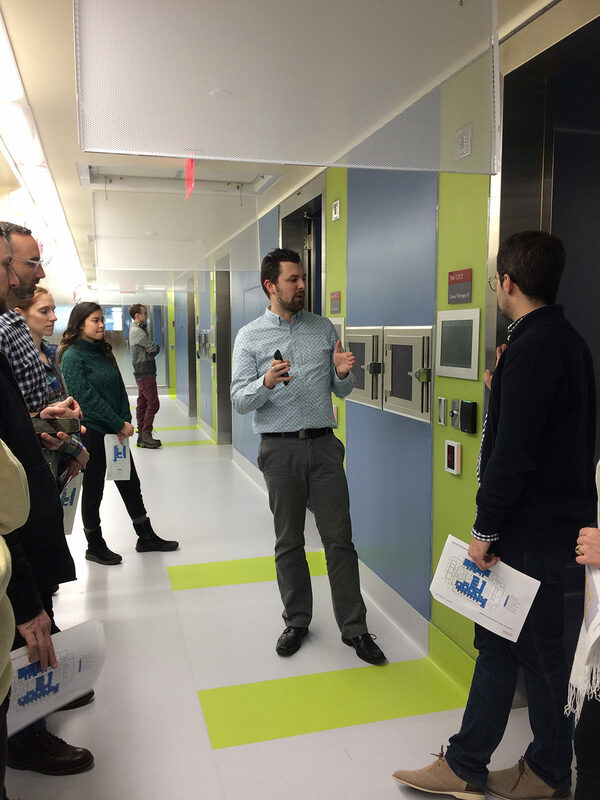 Our Young Designer’s Core recently toured the nearly completed Cell Manipulation Core Facility at the Dana-Farber Cancer Institute. The project is a culmination of multiple years of planning, design and construction and will represent one of the largest facilities in the United States specializing in the research and production of customized cancer treatments. The renovation consolidated programmatic elements formerly spread across eight locations on Dana-Farber’s campus into a centralized location on the 11th and 12th Floors of the Smith Building. The facility serves patients at Dana-Farber, but will also facilitate treatments and research for the greater Longwood community of Boston Children’s Hospital, Beth Israel Deaconess Medical Center and Brigham and Women’s Hospital. Throughout all design phases, the team imagined the project as a swiss watch; a beautiful product concealing the complex network of interworking and moving parts. Having last visited the site with only the framing complete and mechanical systems half installed, I was pleased to see the nearly completed space needing only system balancing and minor touch-ups. I was most struck by the quality of light and openness in the space; a characteristic of one of our design concepts. Our intention was to emphasize view corridors and create connections from the middle of the floor plan to the exterior to give each user access to natural daylight. Not only does the space capture that idea well, but it truly blurs the lines between the ISO-classified space and the non-classified office and circulation space. The views from inside the classified space, particularly on the south and southeast face of the building, are stunning, with many of the view corridors extending out to key buildings in the greater neighborhood. From almost every position on the floor you have a sense of translational science on display; the ability to see researchers and staff working in their labs to develop drugs that cure cancer is incredible. 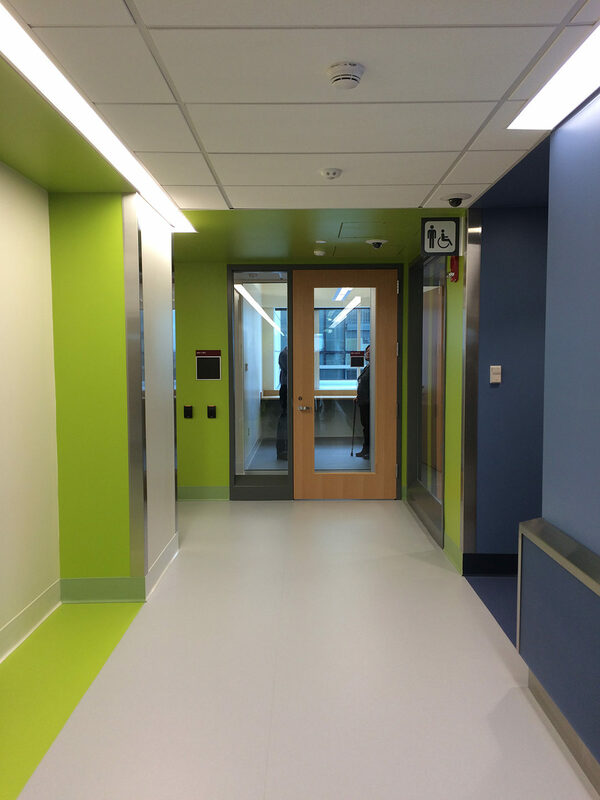 To help organize the staff’s arrival and sequential movement through this space, walls are painted blue to highlight the entry and exit thresholds. A subtle green resin-panel flush with the wall and stripe on the floor signal another level of hierarchy at entry points into either a lab or an ISO-Classified Airlock, which is where staff will have to further gown and put on additional PPE (personal protective equipment). Within the classified space, it was remarkable to see all of the wall device-panels executed so well, as they were one of our main design features. There are 19 variations of the panel, and one is located outside of each lab to organize every electrical and mechanical readout device associated with that room. Each type of space dictated a certain set of wall-mounted devices that can often overwhelm walls within labs. The varying devices include card readers, push plates, pressure monitors, pressure sensors, clean-mode keyed faceplates, humidistats, thermostats and visual readout panels. These devices let the users know the particulate count within the room, humidity levels and air change rates, in addition to sensors and room monitors. 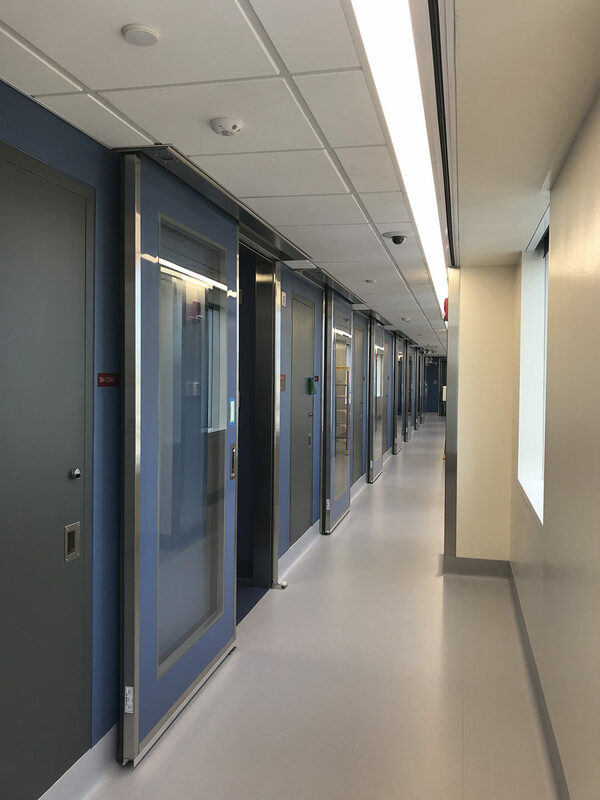 It was exhausting even just typing all of that – but it was so critical to the design that these devices be well-organized and placed in exact locations throughout the facility so the staff would know the precise environmental condition of that room for their procedures. 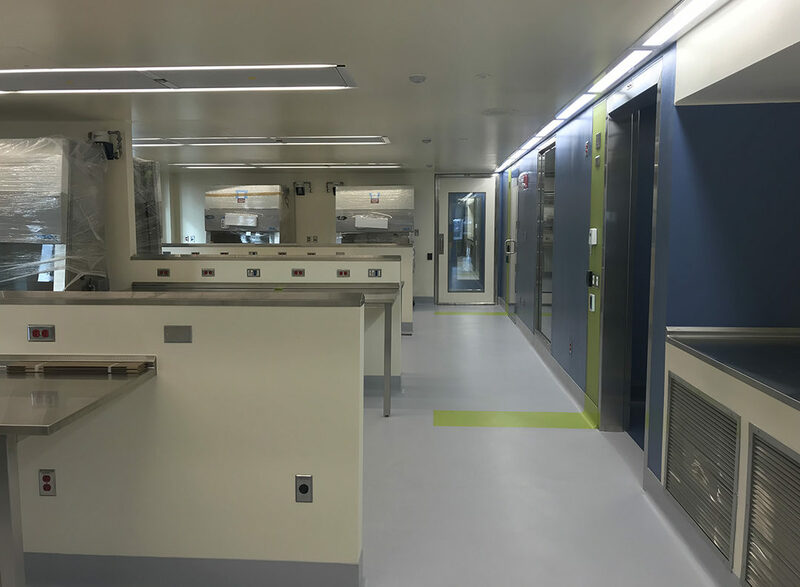 Because this is a clean-room environment, all of the materials and details within the space were designed and built to prevent the accumulation of any type of foreign particle and to withstand the harsh, daily use of cleaning chemicals. Some of these design features include coved flooring, coved wall-to-wall and wall-to-ceiling intersections, high performance coating on all walls (in this case, epoxy paint) angled window sills and all-stainless steel casework. Sleek, interlocking seamless molded fiberglass doors with indicator lights are found throughout the space, including a sliding version that makes you feel like you are entering the Starship Enterprise. All of the corridor light fixtures are custom clean-room, gasketed LED fixtures. The ceilings are remarkably free of cluttered items that can sometimes be a visual nightmare which was achieved by clear design intent with our engineers and contractor. We held many coordination meetings to both limit and control the locations and sizes of access panels in the labs. The use of Huntair’s Cleanpak Integrated Ceiling Plenums allowed us to group the LED Lights, Sprinkler Heads and HEPA Filters within a single-framed element in each room and gave us more control over their alignment; we also located shut-off valves in accessible ceilings outside of the classified zone. We visited the site the day before it was to be closed to non-gowned visitors, so we were lucky to be able to move unrestricted throughout the space. It was amazing to walk through and think about all of the coordination that went into achieving even the smallest of details – these architectural victories can sometimes be lost on you in the midst of long nights at the office. This project perfectly embodies a principle we live by here at Payette; we strive to foster innovation not only in our design, but by providing the end users with an exceptional space custom-tailored to their research, which in turn fosters their own innovations and discoveries. By providing a space that is so highly attuned to our client’s work will in turn empower their own work and research to find a cure. The feedback has been very positive. An interesting side note is that during the design phase, we had to convince both the leadership and user group to utilize fully-glazed doors and glazed partitions throughout the facility to provide the openness and quality of light that matched out concept. When the building inspector walked through the space, he was apparently questioning the amount of glazing used and thought it may be a safety hazard. The users protested saying they needed the openness and visual connections to perform their work. It was great that the trust between the design team and end users had been built early in the project and that they wanted to fight for the design as much as we did! Nice article, thank you for the report! It looks very clean, bright and well executed. How has the feedback been from the client and end users?